Down through the ages traditional Irish music has relied on many factors to help it through some of the darkest times and challenges and even indifference by general populace in Ireland. One of the core means of passing it on from one generation to the next exists in the family unit where the music is as close to heart as it is to the hearth of the home place. The warmth of fireside music and its connection to Ireland’s rural humble roots has proven to be one of the strongest bonds and assets to Mother Ireland that its cultural heritage has ever produced. It flows fluidly in the bloodlines of the diaspora no matter where it may roam, and the Boyle family of Co. Donegal is one of its most striking examples based on two CDs released at the close of 2010 and into 2011. As part of the 17th annual Frankie Kennedy Winter School in Gweedore, Co. Donegal that opened on December 27, the opening night event was a CD launch of A Feeling in the Blood: A Comprehensive Picture of Fiddler Neillidh Boyle and His Music. Since the festival has both entertainment and educational objectives, it dovetailed with the ongoing important work of Cairdeas na bhFidileiri (www.donegalfiddlemusic.ie) who produced the three-CD package containing all the known recordings of the iconic and articulate fiddler long associated with Donegal music who overlapped Michael Coleman of Sligo and Captain Frances O’Neill, who share a legacy of preserving the native music of Ireland. One major distinction is, however, that Neillidh (or Neal) was actually born in the U.S. in 1889 to Donegal immigrants who bucked the tide and returned home to their ancestral homeplace in Ceideadh outside of Dungloe when Neillidh was eight years old. 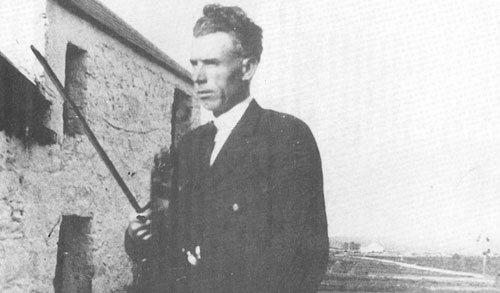 Already a fluent Irish speaker from birth, he took up the fiddle upon returning and dedicated himself to it as badge of his national identity. Like Coleman earlier in America, Boyle was recorded in the late 1930s in Dublin and established as one of the genuine fiddle geniuses of his era, later to be recorded for radio and folklorists like Alan Lomax for both his music and strident views on the abysmal state of appreciation for traditional Irish music in Ireland at the time. He feared for its viability and voiced his objection for the neglect of the rich musical well in the tradition throughout the Emerald Isle which valued more modern and contemporary music from other parts of the world. His opinions echoed those of many who took up the Comhaltas Ceoltoiri Eireann mission to preserve and promote Irish traditional music, and his early call for urgent attention helped ring the alarm bells that would see a seismic shift over the next 50 years since his passing in Glasgow in 1961. The package contains a fascinating 36-page history of Neillidh Boyle and his music and spoken words produced by two long-time respected fiddlers in the Donegal tradition from elsewhere in Ulster but with ties to the late Frankie Kennedy. Rab Cherry, like Frankie, is from Belfast, and Dermot McLaughlin is from Derry and a brother-in-law of Kennedy, both of whom have worked tirelessly for decades preserving the Donegal fiddle style through workshops and recordings highlighting their fiddling forebears. The next significant chapter for the Boyle family, like many Donegal émigrés, would be moving to Glasgow for better work opportunities in the late 1950s and 1960s when Glasgow was ready to develop rapidly infused with a steady stream of Irish immigrant labor. Though Neillidh died within a year of bringing his youngest children over in 1961, he sent them on a musical path with a family band that appeared in the Magic of Ireland shows and later the Tirconnail Ceili Band. His son Hughie played piano and piano accordion, and outside of his day job in construction he played in showbands and ceili bands where side money and work came in handy to support his own family and their musical aspirations. Informally, they played music at home and daughter Kathleen Boyle, who played piano and piano accordion like her father fell deepest into the well of traditional music. Comhaltas’ missionary work in Glasgow, where the first branch of CCE outside of Ireland was formed called the Irish Minstrels over 50 years ago, was paying dividends, and the Boyle children reaped the benefits and continue to contribute to the work today. Kathleen became the first candidate to graduate with a degree in traditional music from the Royal Scottish Academy of Music and Drama later formed a Scottish band called Dochas with other students. Over five years ago she was recruited by Joanie Madden to join Cherish the Ladies with whom she still performs on piano and piano accordion. Influenced by other family collaborations in the Cherish the Ladies pedigree, Kathleen decided to make a recording with her father Hughie who after retirement in Glasgow moved back to his native Donegal with his wife Kathleen. Fittingly, it also earned a Glasgow launch a couple of weeks later as part of a CCE weekend where Hughie served as the MC while St. Roch’s music school and ceilithe bands rocked and rolled with trad music. Featuring 11 varied tracks, the new CD makes a compelling companion recording not only to the new documentary CD about Neillidh Boyle but also to Kathleen’s solo CD An Cailin Rua from 2008 which contains an original track of Neillidh Boyle’s most famous composition, “The Moving Cloud” accompanied posthumously by Kathleen on accordion and Hughie on piano. There is nothing clouded about the blood coursing through veins of the Boyle clan when it comes to proudly playing Irish music, and if you spent some time with these recordings, those feelings will make you like you are at home as well. Back to Donegal and An Cailin Rua can be ordered at www.cherishtheladies.com or www.kathleenboyle.co.uk and Feeling in the Blood from www.donegalfiddlemusic.ie. 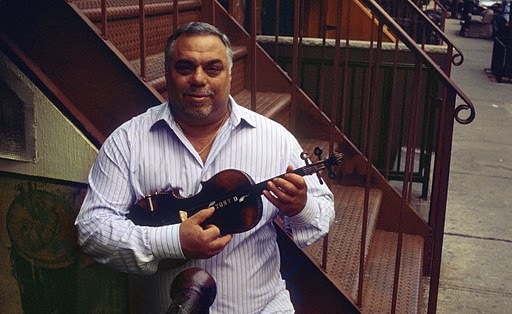 COMING up this weekend is the monthly session at the IAANJ (www.iaanj.com) in Rockaway, New Jersey with special guest fiddler Tony DeMarco the guest host on Saturday, February 12 at 8 p.m. There is the opportunity for workshops prior to the session start if you contact organizer Iris Nevins (email irisnevins@verizon.net) in advance. The Brooklyn-born DeMarco, one of New York’s fine Sligo-stylists, has also started another Thursday night session in the East Village at Percy’s Tavern at 13th Street and Avenue A that kicks off around 9 p.m.
Tony and bodhranista Anna Colliton have arranged for a special workshop and concert with the acclaimed Sligo bodhran master Junior Davey who will be on a visit from Ireland. Davey has won five senior All-Ireland championships and has taught many prize-winners throughout Ireland. It takes place on Sunday, February 20 with a bodhran workshop from 12:30-2:30 p.m., followed by a concert with Davey, DeMarco and Don Meade from 3:30-5 p.m. at the Irish Arts Center, 553 West 51st Street, New York. Email annacolliton@gmail.com or call 212-757-3318. Another New York fiddler, Eileen Ivers and her band the Immigrant Soul, will make a special family-friendly appearance this coming Sunday in Rockland County at Dominican College. The show is a benefit to raise scholarship funds for Dominican (www.dc.edu), the small Catholic college in Blauvelt, New York. The show takes place at 5 p.m. at the Hennessy Center. Call 845-848-7406. Next week Lunasa piper Cillian Vallely based in New York reunites with his Cork-based brother Niall Vallely on concertina for a small tour that also includes John Doyle on guitar and vocals. It was six years ago when the Vallelys recorded the CD Callanbridge together, and the Armagh natives come from a solid family in Irish music. The first gig is on February 15 in Alexandria at the Lyceum Theatre (phone 800-404-9049) followed the next night at a house concert in Voorhees, New Jersey (phone 856-795-7637). On Friday the 18th at 8 p.m. they appear at the Newtown Meeting House in Newtown, Connecticut for the Shamrock Irish Traditional Music Society (203-254-1271). Niall Vallely and Doyle will use the interim week to tour another Vallely musical offspring, Buille, with his other brother Caoimhin (piano), who plays and tours with Niall’s wife Karan Casey as well. Among their appearances are Monday, February 21 at Club Passim in Cambridge, Massachusetts (www.clubpassim.com) and in New York at Joe’s Pub on Tuesday, February 22 at 7:30 p.m. (212-239-6200 or publictheater.com). For more details visit www.vallelymusic.com.